Like Kikka Sushi on Facebook! 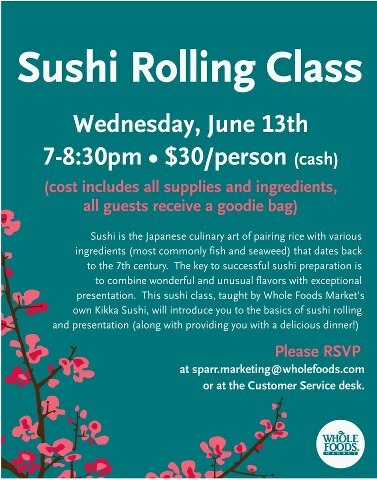 Come to your local Whole Foods Market to learn about our sushi-rolling classes! Kikka not only makes delicious sushi but we show you how you can make your own sushi at home! Enroll in a Kikka Sushi-Rolling class taught by one of our trained Sushi Chefs and you will learn the art of how to roll sushi to impress that sushi lover in your family! Check out our Calendar to see when the next available class is! We hope to see you there! Kikka Sushi © All Rights Reserved.